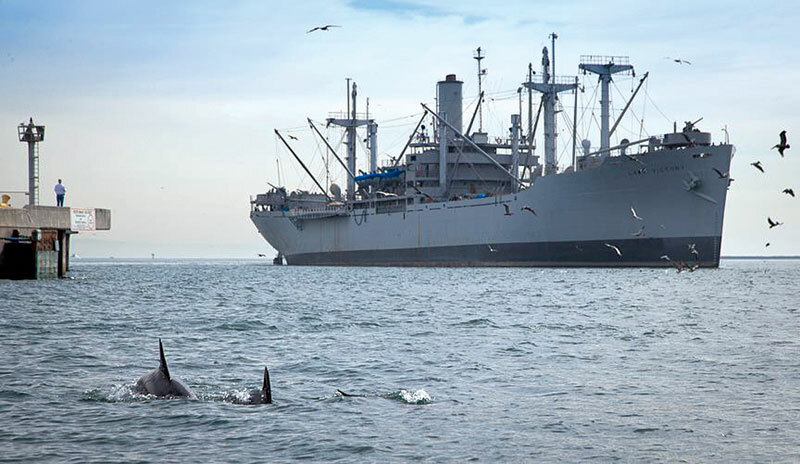 SAN PEDRO — The historic S.S. Lane Victory merchant ship traversed Los Angeles Harbor’s Main Channel Feb. 3, leaving behind its home underneath the Vincent Thomas Bridge to arrive at Berth 46, at the southern tip of Cabrillo Way Marina. The plan to move S.S. Lane Victory, which served during World War II, the Korean War and the Vietnam War, was part of a chain of events occurring due to the impending expansion of the China Shipping Container Terminal (berths 97-109) to include Berth 96 — the current home of the Catalina Express’ San Pedro passenger terminal. At the Jan. 5 Los Angeles Board of Harbor Commissioners meeting, the board approved the move of Catalina Express from berths 95 and 96 to berths 94 and 95, giving up the current home of S.S. Lane Victory in the process. The 455-foot vessel made the trek at 9:30 a.m. Feb. 3, arriving at Berth 46 a little over an hour later without incident. The ship was closed for a week, reopening Feb. 13 for its regular tours. Rachel Campbell of the Port of Los Angeles said the ship will stay at Berth 46 for the next nine months, awaiting a move to the port’s East Channel at nearby Berth 50 once that berth has undergone improvements. Berth 50 could be designated as the new home of Lane Victory, but no permanent spot has been set by Port of Los Angeles officials yet, as they await the progress of the San Pedro Waterfront Project and the arrival of the 887-foot battleship USS Iowa. Berth 46 is located south of the intersection of 22nd and Miner streets. The dock can be reached by driving south to the 2500 block of Miner Street, to the terminal gate. Free parking is available past the gate, near the dock. Built in Los Angeles, S.S. Lane Victory served in three wars carrying military cargo, rescuing more than 7,000 Korean refugees from Wonson and evacuating 3,800 U.S. troops, 1,100 vehicles and 5 tons of supplies from Hungnam while under fire. During times of peace, the ship operated as part of the merchant fleet. After years of deterioration, S.S. Lane Victory was restored to its original condition by volunteers from the U.S. Merchant Marine Veterans of World War II. Now a nationally recognized historic landmark, the ship serves as a museum and a memorial to the service and sacrifice of all Merchant Marine sailors and Navy Armed Guardsmen.